The very mention of the term "pineal gland" creates a mysterious aura. Renowned French philosopher, physiologist, physicist, natural scientist and mathematician Rene Descartes (1596-1650) called it "the seat of the soul." Others believe it is the Centrum that carries the "life code" and conveys orders to the body. Recent academic studies have found that the pineal gland contains light-sensitive cells which function like those of the eye's retina, testifying to the fact that the pineal gland can "see." Thus, it is also known as the "third eye." Modern research on melatonin production by the pineal gland has unraveled its mysteries to some extent. 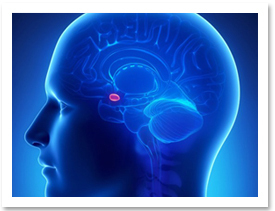 The pineal gland is a flat, cone-shaped organ about the size of a pea lying in the center of the midbrain. It reaches its largest mass during childhood, but calcifies and shrinks with age. Melatonin production by the pineal gland is determined by the amount of light received, for the gland plays the role of a bodily clock, due to its sensitivity to light and regulation of the sleep-wake cycle. During nighttime sleep, melatonin levels in the body rise, reaching a peak between 11 PM and 2 AM, and then drop dramatically when a new day dawns. Melatonin production is related to age, increasing at three months after birth, peaking at the age of six, and beginning to drop after puberty. Melatonin has a simple chemical structure, but it plays a decisive role in bodily functions, monitoring the work of the glands and organs, and regulating hormone production. It also controls over-stimulation of the sympathetic nerves to lower blood pressure and slow the heart rate, thus reducing the impact on the heart. It also alleviates mental stress, improves sleep, adjusts the body's biological clock, relieves jet lag, strengthens immunity, increases the body's resistance to germs and viruses, and prevents cancer and senile dementia. Melatonin production is inversely proportional to that of serotonin, a chemical that constricts the blood vessels and acts as a neurotransmitter. The mind is most active during the day, when it runs wild and is distracted, resulting in an increase in the amount of serotonin required by the nerve cells. During the night or meditation, when the mind is less active, less serotonin and more melatonin are produced, and the situation changes. However, when the eyes perceive light, melatonin production is reduced. This is why night workers and those who sleep with the light on have a lower immunity to disease and a higher propensity to develop cancer than others. Two studies in the U.S. have shown that bright light at night reduces melatonin production and induces estrogen secretion in women, which in turn increases the incidence of breast cancer among female night workers. Research on infants who died from sudden infant death syndrome (SIDS) found that the babies had underdeveloped pineal glands, which lowered melatonin levels and weakened the brain's ability to deal with free radicals (molecules with an unpaired electron), thus making the brain vulnerable to free radical damage. Another study on children and adult hypochondria suggests that the melatonin levels of psychiatric patients are lower than those of healthy people. Melatonin exists in small quantities in many plant species, including oats, sweet corn, rice, ginger, tomatoes, bananas and barley. Intake of other foods such as kelp, soy beans, pumpkin seeds, water melon seeds, almonds, peanuts, yeast, malt, and milk helps to increase the body's melatonin production. Lower food intake ensures normal melatonin levels. Research shows that old mice given less food have healthy pineal glands like those of young mice, and can regulate melatonin production. Their melatonin levels are 80 percent of those found in young mice, compared to 40 percent for old mice without food restriction. Although melatonin has a significant effect on the human body, no definite conclusions have been reached about whether melatonin supplements are beneficial to health. Research shows that melatonin production is higher in women who meditate. Big-toe exercises also stimulate melatonin production. Physical exercise during the day increases melatonin levels, while night exercises have the opposite effect. Therefore, it is advisable to eat less, meditate, exercise regularly during daylight hours and lead a disciplined life.